JHONAS ENROTH JERSEY CARD LOT. BUFFALO SABRES. ( 5 ) 2009-10 UPPER DECK'S. ALL ROOKIE'S. 5 JERSEY CARDS ALL FOR ONE PRICE ! 11-12 Panini Titanium Hat Tricks Triple Jersey Ryan Nugent-Hopkins Calvin de Haan Ryan Johansen #30 187/199. 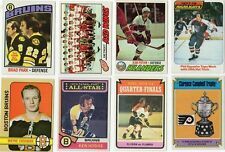 (4) 2018-19 Upper Deck MVP NHL Hockey Trading Cards New 34ct. HUGE LOT OF HOCKEY 140 game used, 89 autographs, and 4 combo autograph memorabilia cards. 233 in total. Black diamond,upper deck, SP, SPX, ICE, fleer, beehive,artifacts, hot prospects, Topps etc.. short prints, rookies, single- double-triple & quad colors on game used, single, double, quad game pieces on cards. Some players- Wojtek Wolski,Joe Salic, Ray Bourque,Dan Bouchard, Marc A. Fleury and many more. All in plastic holders. Original owner indicated prices in back of plastics was the most recent sales on eBay- totaling over $2000. Cards range in price from $3 to $15 each. Comes in cardboard card box. 16-17 UD SP Game Used Kyle Connor Draft Day Marks /35 SP Mint - Young Guns Star!